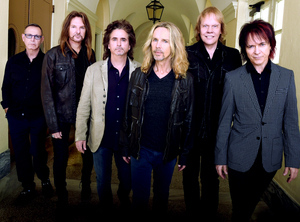 Styx will continue to perform their concert in Cary, NC on Wednesday, May 18, 2016 at the Koka Booth Amphitheatre, and will be donating proceeds from the night to various local charities. The band condemns the North Carolina law reinforcing discrimination against LGBT citizens, and especially since original bassist Chuck Panozzo has been an openly gay man since the late 1990s. A raffle will be held their own Rock To The Rescue for one lucky fan to win a guitar signed by the members of the band as well as special guitar Don Felder (formerly of the Eagles). Funds raised as a result of the raffle, as well as ticket sales and donations taken at the venue, will benefit Girls Rock Camp Foundation, as well as local LGBT charities such as Equality NC (the oldest LGBT rights action group in the U.S.) and The LGBT Center of Raleigh.